PRODUCT DESCRIPTION: Tapered corks designed to fit and seal the holes created by nesting carpenter bees, ground digging wasps and holes drilled through slabs or walls. WHERE TO USE: In holes created by carpenter bees who drill through wood to create nests. After the holes have been treated with Drione Dust, cork them for two reasons: 1) Having the holes sealed will keep the Drione Dust protected so it will last several years. 2) The corked holes will allow you to keep track of the nests you have treated. New holes will be easier to find since they won't be sealed. You can also use these corks to seal ground nests built by digger wasps, yellow jackets, etc. 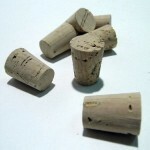 Lastly, use these corks to plug drill holes in slabs or wall voids. RATE OF APPLICATION: One cork per nest. Will adult carpenter bees drill through the cork? They could but not if you follow the treatments we have listed in our article. So in case you didn't read it, here's a brief summary of what could happen if you don't treat thoroughly. First, any holes you find should be dusted with Drione. Once dusted, the holes should be left open for a few hours. But within 1-2 days, you should seal them with the 1/2" corks listed on this page. Capping the holes insures the dust will last a good 6-12 months and kill any hatching eggs or pupae. Now if there were any adults still in the nest when you treated, they would be dead within 10-20 minutes so any sealed inside the nests won't be able to drill out through the corks. Second, you need to spray the outside surfaces of the wood they were targeting with Cypermethrin. In fact you should also be spraying the corks. This treatment will stop them from drilling new holes and obviously, stop them from drilling through the corks. This is important because if by chance you treat and cork nests with the females still outside the nest, they'll be determined to get back in and could drill new holes or through the cork you use to plug the hole. But treating with the Cypermethrin will insure this doesn't happen. Hello. We live in Kentucky and have a cedar fence with treated posts. Last year we saw an uptick in carpenter bee presence and now the time to handle. I've had a local pest company treat the posts but they claim these old galleries won't be reused. I disagree so I'd like to dust the holes and plug them as well. The trouble is that most of the holes are on the backside of the post covered by a fence slat, not giving me room for a stationary duster. Can you recommend a good duster with flexible rip that I can maneuver into a 1 to 1-1/2 inch space, then turn 90 degrees. I'm not sure I can even get a cork place where I need to. At this time of year, what's the likelihood that it'll be occupied? I don't want to get stung.! Oh, and my pest guy wants me to restain the treated posts with an oil-based stain to help retain the pesticide they sprayed. I've watched your videos and want to do the best thing. Suggestions? First and foremost, you're concerns are warranted. Abandoned carpenter bee holes are commonly found by "other" carpenter bees and reused. Whenever possible, they should be dusted with Drione and corked to prevent new nests from developing. Second, I have dealt with holes that are in "hard to reach" locations so it can be done using one of our traditional dusters. Now you will have to adjust. Basically you'll need to direct the dust "around corners". To accomplish this goal, you'll need some flexible clear tubing. This type of tubing is commonly found at any home center like a Home Depot or Lowes. Pet stores also sell it as well; they call it "aquarium hose" and its used to pump air to underwater filters. I can't recall if you'll need a 1/4" or 3/8" inside diameter hose but if you bring either of the following two dusters with you to the store (do this before you add Drione to it), you'll be able to get the right size. Basically you'll want the hose to fit nice and snug. And you can use a piece that's 6-12" long no problem. I've used pieces as long as 3 feet effectively since Drione is so light and fluffy that it moves through the tube fine with no clogging issues. The tube can be slid up and into the hole allowing for a perfect dusting everytime. And though you might not be able to cork the hole, if you dust it once a year, you'll be fine. Now if you review our carpenter bee videos, you'll learn that even if a nest is occupied when you dust, the bees won't be able to do a thing once they get blasted with some Drione. Basically the effect of the Drione will overwhelm them and render them harmless. Typically some die in the nest but I would say that a good 50-75% crawl out and die on the ground below the nest hole. The following video shows what might happen if you were to dust a hole with a live been inside. As you'll see, there is no danger to the applicator doing the work. Lastly, spraying some Cypermethrin on the fence posts every 1-2 months should stop new holes from being drilled. Do this in the spring and summer so expect to treat 3-4 times a year. Alternatively, mixing some NBS repellent with your choice of stain (1 pint of NBS for every 5 gallons of stain) will effectively repel bees, ants and other pests for 1-2 years once the mixed material is applied to the fence. Do this everytime you stain and you'll be effectively keeping all kinds of pests away. Purchased these 1/2" corks for plugging holes made by carpenter bees. Should have bought more but started with 25, long before I analyzed my problem. After dusting the bee galleries I plugged the holes without incident. 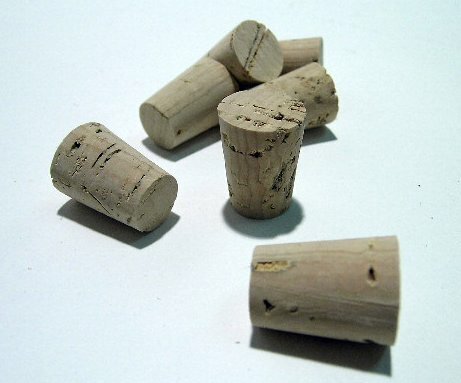 These corks are high quality and recommended. Worked perfectly to plug carpenter bee holes. Prompt delivery. No complaints. After blowing Drione into carpenter bee holes, I plugged the holes with these corks. Later I pulled the corks out and plugged the holes with tapered dowels that I cut to fit. Then I re-used the corks on the next set of holes. These little corks are a perfect fit for those drilled holes made by the wood bees. After placing Drione in the hole I waited and sure enough … there were 3 wood bees that crawled out!! Within seconds they died. I waited a few hours before plugging with these little corks. Job done!! Thank you for helping me save my fence!